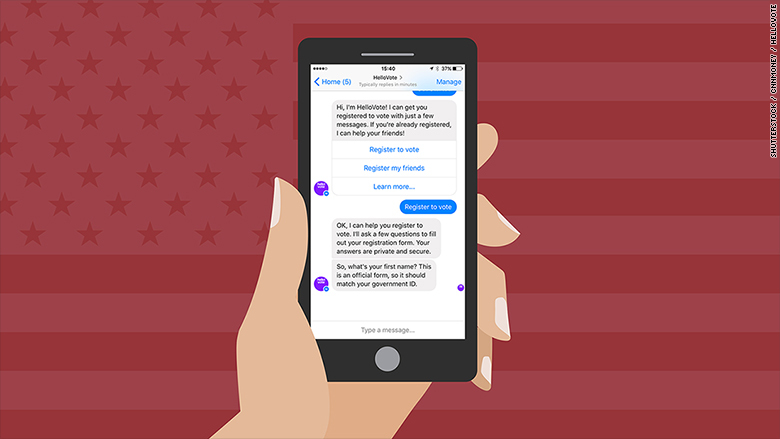 A new chatbot based service is making it easier for anyone to vote. HelloVote launched on Thursday to help people register in about a minute by sending a few texts. In the last presidential election, about 33 million people -- more than 15% of citizens eligible to vote -- were reported as not registered, according to data from the U.S. Census Bureau. Another 28 million, or 13% of eligible voters, did not respond, weren't asked or refused to comment on their registration status. Reasons given for not registering to vote include a confusing registration process, missing deadlines or technical barriers. HelloVote's goal is to get many as many Americans into the polls on Tuesday, November 8 for the upcoming presidential election. The service works via SMS, so you only need a cellphone -- which 92% of US adults own. To test the service -- and yes, I hadn't yet registered in New York -- I gave it a try by texting HelloVote at 384-387. The platform asks for basic information, such as first and last name, address, date of birth and driver's license or the last four digits of your social security number. Related: Tech leaders: "Trump would be a disaster for innovation"
New York requires a printed and signed copy of the voter registration form. I'll soon receive a copy in the mail and need to send it back to the NYS Board of Elections (this varies by state). There's also an option to print out an emailed version. HelloVote covers the cost of postage. "[Although] companies use a lot of the forward-thinking technologies, we haven't seen that trickle down to some of the very basic aspects of our civic lives," HelloVote cofounder Elana Berkowitz told CNNMoney. HelloVote has already signed up national and regional partners, including MTV, Rock The Vote, West Elm, Twilio and Care2. Related: Can Hillary Clinton emojis win over the Snapchat generation? 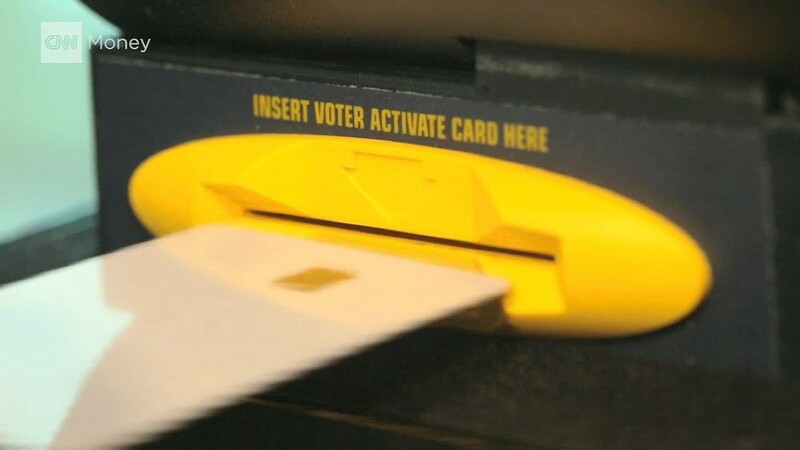 The service is just one of several new tech solutions to encourage people to vote. Earlier this month, nonprofit VotePlz launched a website to help young people check their registration status, register and get their absentee ballot. "There are different approaches to this problem and I'm not sure which will work best," wrote Y Combinator's Sam Altman, one of VotePlz's cofounders, in a post on news discussion forum Hacker News. "But unlike many for-profit startups, it's non zero-sum -- we have a long, long way to go to [get a] 100% voter turnout, and all the organizations working on this share the same fundamental goal."